The Simms G4 Pro Jacket is a multitalented, storm-resistant fly-fishing wading jacket that features the newly updated GORE-TEX PRO shell fabric. The Simms G4 Pro's Gore-Tex fabric is now 15% lighter than previous versions. This wading jacket also features increased abrasion resistance and tear strength from top of the jacket all the way to the bottom. The G4 Pro jacket also features a new super water-resistant Dry Cuff design that enables you to feel free to get your hands/arms wet when fly-fishing, a very handy addition to this revolutionary Simms G4 Pro wading jacket.The G4 Pro jacket also features nine storage pockets, including fly-box friendly bellowed and zippered chest options, two tippet pockets, a convenient sleeve stash, internal woven stretch storage, and one extra large back compartment. What else could you ask for from the Simms G4 Pro Jacket. Simms also swept the Men’s Outerwear category with the innovative G4 Pro™ Jacket taking the honors at the IFTD Tackle Show. With lighter 3-layer GORE-TEX® Pro Shell fabric, integrated tool ports, 9 storage pockets and a highly water-resistant Dry Cuff™ design to keep water out, the G4 Pro is the most advanced jacket ever produced by Simms. 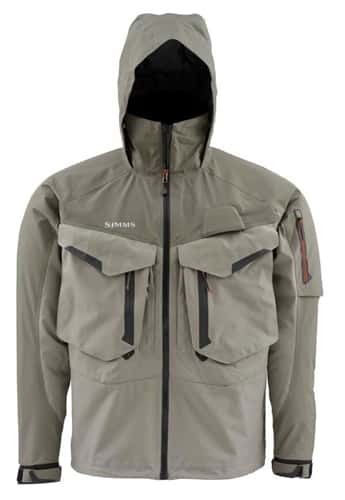 This Simms G4 Pro Gore-Tex Fishing Rain Jacket - Men's is a great jacket for going fishing when it's cold, raining or snowing outside and is very warm and is really constructed in a great manner because it has nice pockets for fly-fishing gear and is also very comfortable to wear and also really looks great too which is always nice. This is the best jacket available. During cooler weather you have no need for your fly vest. The number of pockets on this jacket will allow you to carry whatever you need. Will keep you warmer and dryer than anything you have used in the past. Spend the money and buy the best, you deserve it.